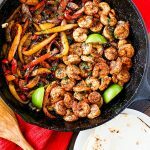 These Skillet Shrimp Fajitas are a quick and easy dinner recipe that is perfect for busy weeknights. 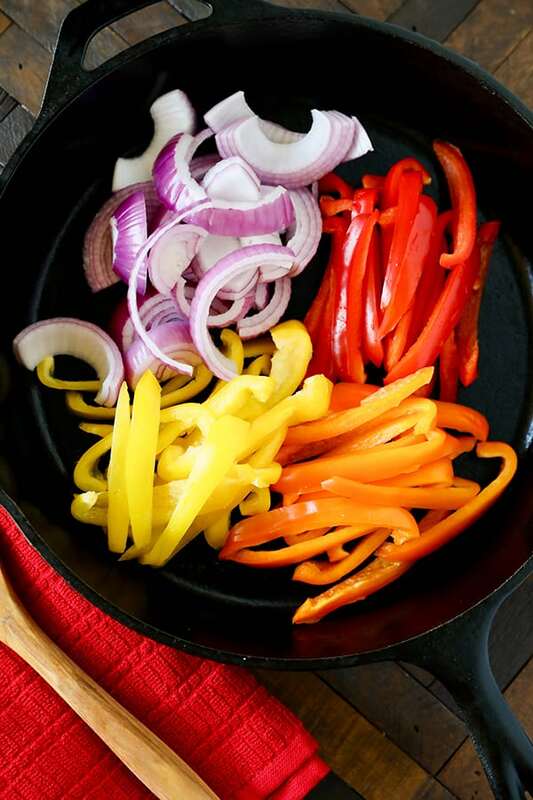 Colorful seasoned bell peppers, onions, and juicy shrimp cooked quickly in a hot skillet and served in a warm tortilla. Fajitas are a weeknight staple at our house. They are family-friendly, fast, healthy, and packed with flavor. 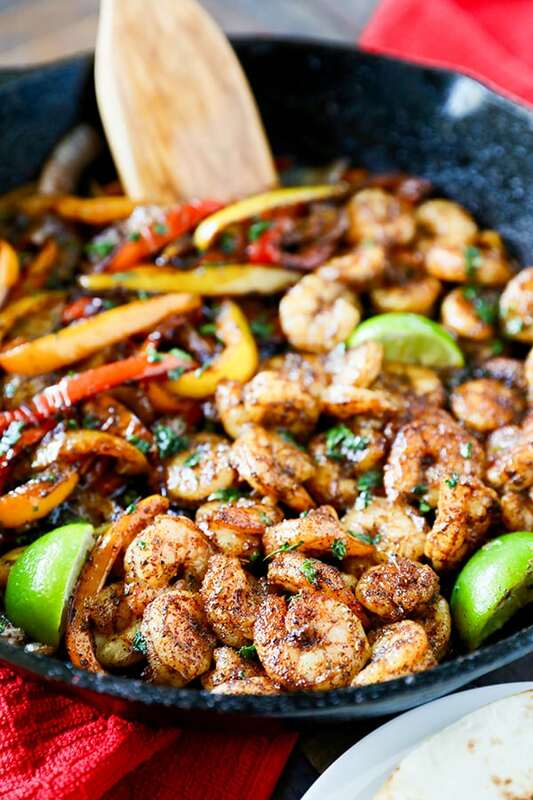 My Sheet Pan Shrimp Fajitas are one of my favorite dinners to make, but with the weather heating up I thought they would convert perfectly to a skillet dinner. I use a large 12 inch cast iron skillet so there is plenty of room for the veggies and shrimp. Cast iron pans are extremely affordable and will last a lifetime! Use a large skillet so the pan is not crowded. 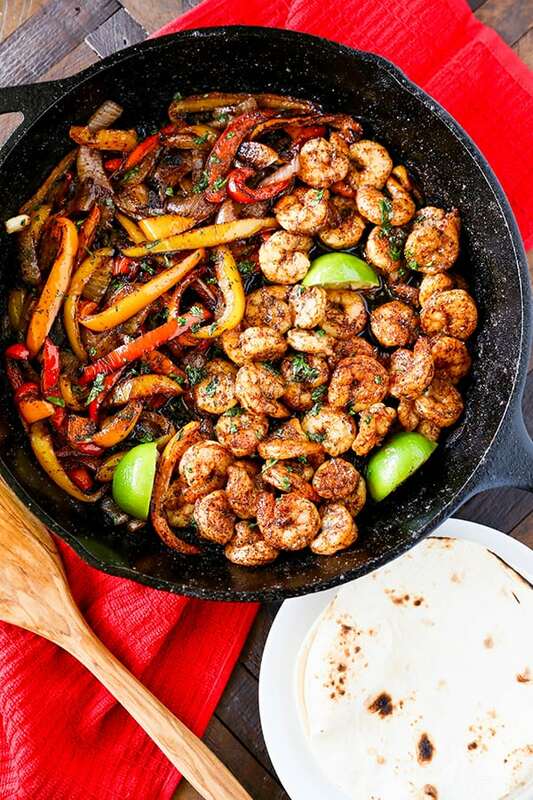 Have all ingredients ready to go before you start cooking, these skillet shrimp fajitas only take a few minutes to cook. Pat shrimp and veggies dry before cooking. Serve with guacamole, sour cream, salsa or cheese. In a small bowl, combine salt, pepper, chili powder, garlic powder, onion powder, cumin and smoked paprika. Heat 1 tablespoon of olive oil over high heat in a 12 inch cast iron pan. Add onions and bell peppers and 1/2 of seasoning mixture. Cook for about five minutes, or until onions and bell peppers are tender. Push onions and bell peppers to the side of the skillet to make room for the shrimp. Add remaining olive oil to skillet, followed by shrimp and remaining seasoning mixture. Saute shrimp until pink and cooked through. Squeeze juice from one fresh lime over skillet and sprinkle with chopped cilantro. Serve in warm tortillas. Have shrimp, bell peppers and onions prepared before you start cooking. This recipe only takes a few minutes to cook and you want to have all the ingredients ready to go once you start cooking. I love easy to prepare meals. This is definitely a life saver, especially on weeknights. We will definitely try this soon. Thank you for sharing this recipe.